Who says your shed has to be plain? At Millworkcity, we believe in creating balance to make buildings as attractive as possible. That’s why we carry several shed cupolas in various sizes. Our inventory includes PVC cupolas with copper roofs and painted pine cupolas with copper roofs, so you can choose exactly what you need. 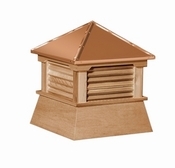 These shed style cupolas feature four louvers on each side. With clean lines and excellent symmetry, these square cupolas are ideal for covering vents or pipes; they can also be used as purely decorative elements. Because they’re so versatile, they match almost any style. Each of the shed style cupolas in our inventory is affordably priced. We carry several sizes, from 16-inch by 18-inch to 30-inch by 36-inch, so no matter what size your structure is, it’s easy to find a cupola that fits the bill.